WHERE IS THE ROPE OF ALLAH? Sahaba narrated Hadith on Imam Al Hasan and Imam Al Husain (Peace be upon them) and used, “alaihimassalam” in reverence for the grand children of the Prophet Muhammad alaihiswalathu wa Salam. Aqidha of Jahil Sunna wal bidha, using ‘alaihissalam’ is only allowed for the Prophets. 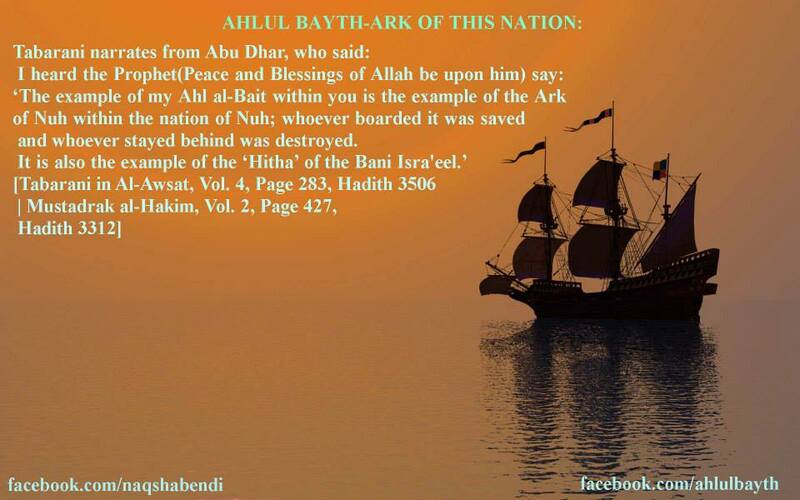 Loving Ahlul Bayth is a part of pure Faith and following Ahlul Bayth is a necessity for right guidance. Zaid bin Arqam narrated that the Messenger of Allah (Peace and blessings of Allah Be upon him) said to Ali, Farimah, Al-Hasan and Al-Husain (Peace be upon them) : “I am at war with whoever makes war with you, and peace for whoever whoever makes Peace with you”. Some Jahil Saudi muftis say, Rahmahullah for Yazid. Some other Jahils say, the Hadith is weak. But there are Ahadith in support of this Hadith. “Ali, you are to me in a position that Harun was to Musa [except that there is no prophet after me] Jami At-Tirmidhi (Sahih), Sahih Muslim, Ahmad, Tabrani. The Chapter in Quran on “Hypocrites” (Sura Al Munafiqun) clarifies rest of the matter. عَنْ أَبِي هُرَيْرَة رَضِيَ اللهُ عَنْهُ قَالَ: قَالَ رَسُول اللَّهِ صلى الله عليه و سلم إنَّ اللَّهَ تَعَالَى قَالَ: “مَنْ عَادَى لِي وَلِيًّا فَقْد آذَنْتهُ بِالْحَرْبِ، وَمَا تَقَرَّبَ إلَيَّ عَبْدِي بِشَيْءٍ أَحَبَّ إلَيَّ مِمَّا افْتَرَضْتُهُ عَلَيْهِ، وَلَا يَزَالُ عَبْدِي يَتَقَرَّبُ إلَيَّ بِالنَّوَافِلِ حَتَّى أُحِبَّهُ، فَإِذَا أَحْبَبْتُهُ كُنْت سَمْعَهُ الَّذِي يَسْمَعُ بِهِ، وَبَصَرَهُ الَّذِي يُبْصِرُ بِهِ، وَيَدَهُ الَّتِي يَبْطِشُ بِهَا، وَرِجْلَهُ الَّتِي يَمْشِي بِهَا، وَلَئِنْ سَأَلَنِي لَأُعْطِيَنَّهُ، وَلَئِنْ اسْتَعَاذَنِي لَأُعِيذَنَّهُ”. This is enough to understand the teachings of Messenger of Allah (Peace and blessings of Allah Be upon him) regarding Ahlul Bayth and pious companions and hatred and malice against them bring a Retribution from Allah the Mighty and Sublime. See Quran 4:65 But no, by your Lord, they can have no Faith, until they make you (O Muhammad SAW) judge in all disputes between them, and find in themselves no resistance against your decisions, and accept (them) with full submission. And Quran 4:80 Whoever obeys the messenger is obeying GOD. As for those who turn away, we did not send you as their guardian. ,so if you not follow as the Messenger of Allah Nabi Muhammad alaihiswalathu wa Salam instructed, then you shall certainly become misguided and strayed! So take wisdom and follow correct path.